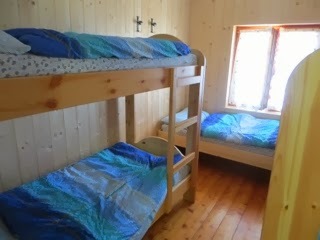 With another long day in our itinerary, we start breakfast at the earliest possible time, 7:00 a.m. There is nobody else in the dining room, and for a moment I envy those with the privilege to sleep in. Breakfast is good, a nice variety of items to choose from, and a delicious bread. I eat much more than I usually do, there is supposed to be a long climb at the beginning of our day and I will need the energy. 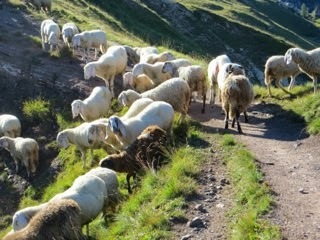 On the trail by 8:00 a.m., heading uphill without warm up. 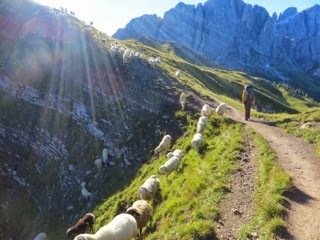 The scenery is beautiful, Passo Valles becomes a dot way bellow us, we are back in a world of high mountains. 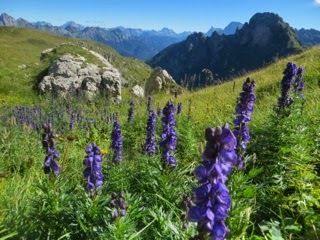 At first the dirt trail leads through meadows full of purple blooms. It’s steep but easy to negotiate, and even the several cable protected sections are a breeze. 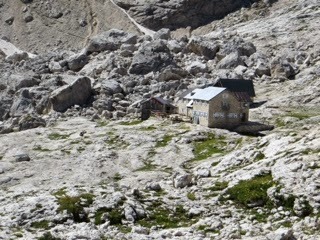 Reaching Forcella Venegia, 2,212 m, at 8:35 a.m. and Passo Venegiota, 2,303 m, an hour later, Refugio G. Volpi di Misurata al Mulaz comes in a view at 12:19. We are now at elevation of 2,560 with many more meters to go. After a break to brace ourselves for the steep gully that awaits us, we are back on foot at 12:49. Trail 703 which we start following here lets us gain elevation quickly. 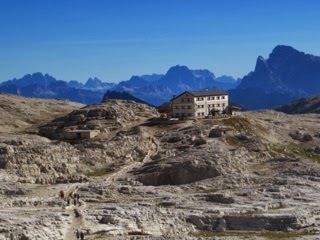 It is a firm path, stabilized by lumber beams, several switchbacks and we are looking at the Refugio from couple hundred meters higher. 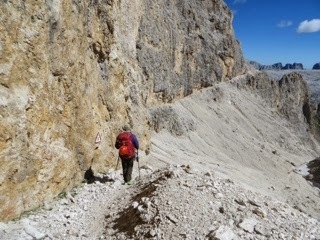 At 13:50 we are clipped in working our way up a via ferrata. It was described in our book as a little tricky, but except maybe couple steps we do not find it difficult at all. 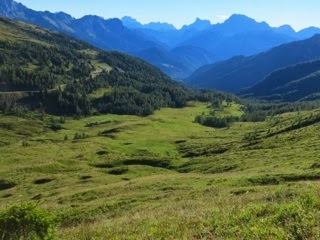 At 14:55 we reach the pass. It’s downhill from here. Literally. The trail drops down a gully filled with loose scree, we hug a rock wall tightly to prevent slipping at the higher, more exposed area, and then slowly proceed down on loose switchbacks, trying to avoid sliding down. It takes a toll on our legs. (Turning right at the top for perhaps 60 feet and then heading down the gully on much gentler grade would make it easier to descent. It becomes obvious once we are at the bottom, having followed the AV2 route down). 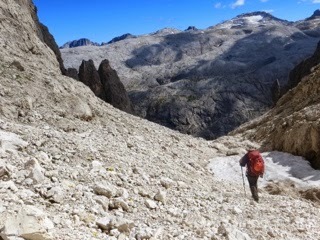 The trail markings on our map suggest the rest of way to Refugio Rosseta (Pedrotti) should be on regular trail with a section of long but easy via ferrata. The adventure; however is far from being over. 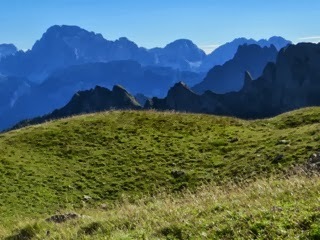 For somebody (like me) who does not thrive in heights, the narrow path along a cliff with a view of a valley over 2,000 feet bellow, is not necessarily an idea of easy trail. I do not dare to look down, staring at every step in front of me I pray for this section to be over soon. And then a rock outcrop comes which we have to cross. Another one soon follows, and as we find out, most of this “trail” involves exposed scrambling, rarely protected by cable. This, according to the map, was supposed to be an easy trail. 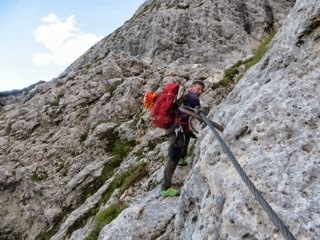 By the time we reach the via ferrata section at 17:30 my legs are trembling. I grab the cable, trying to calm my racing heart. The fact that one of the anchors peels off the wall does not help the case. 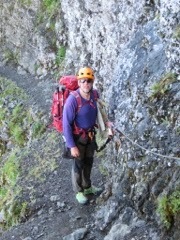 Otherwise the ferrata is mostly easy. 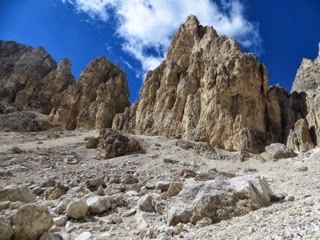 It takes us along cliffs, crosses an exposed gully (some down climbing is required) and spits us on the other side, where the trail is still as narrow and as high as it was before but not with less obstructions we start making a better time. To my liking we now also reach few areas of less exposure (further away from the cliff). A relief comes at 18:00 when we enter a valley carved by a glacier many millions of years ago. 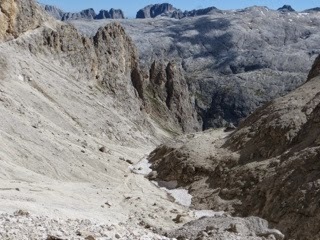 The glacial flow still can be seen in the shape of the valley floor. Still ways from “home” with one last climb ahead of us but the exposure is now over and even though our legs are spent we start making a decent time on the grippy rock as we climb up towards the evening sky. 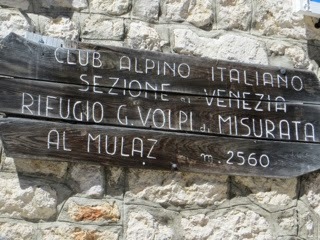 At 19:01 a sign at a junction announces Refugio Rosetta is 10 minutes away. Couple minutes later we arrive at another junction, unmarked. The main trail is heading up to the left and then curves back while a smaller, faint path weirs off to the right. Both are correct, the right path being slightly shorter while the other one offers a gentler grade. Exhausted we arrive at the Refugio Rosetta Pedroti at 19:10, just barely making dinner. And here our Alta Via 2 trek concludes. 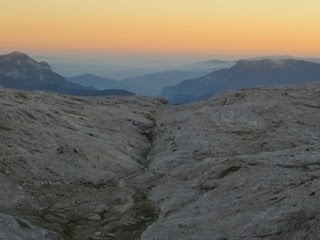 Tomorrow we will descent to the town of San Martino. We will eat some good pizza, drink some good wine, and plan our next adventure.